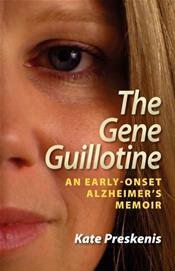 The Gene Guillotine: An Early-Onset Alzheimer's Memoir is a 306 page memoir told in first person in the present tense. It leads the reader through the duration of early-onset Alzheimer's disease (also known as young-onset Alzheimer's) from the first symptoms as seen in the narrator's mother, to personality changes, mental decline, death of a caregiver, placement in care facilities, the discovery of the gene that causes Alzheimer's in their family, to the mother's final breath. This book shows love and compassion as well as the mental anguish, emotional toll, and the ugly side of Alzheimer's. The narrator brings the reader into family discussions about her mother's strong living will and end-of-life wishes for this terminal disease. After her mother's death, the narrator describes her participation in research studies for familial Alzheimer's disease, genetic counseling and wrestling with her decision whether or not to learn her own genetic status. It explores the feelings, fears and life choices of the narrator who knows she may also get this genetically inherited disease that has already claimed five family members. Keywords: The Gene Guillotine, autosomal dominant Alzheimer's disease (ADAD), familial young-onset Alzheimer's disease, familial early-onset Alzheimer's disease, dementia, Noonan Family, siblings, generational, memoir, ethics, hospice, death and dying, caregiver death, caregiver stress, caregiver burnout, spouse death, genetics, genetic status, genetic counseling, genetic etiquette, genetic disease, anger, aggression, violent, living will, advance directive, right-to-die, end of life decisions, research, genetic testing, finding out, inherited, heredity, personal story, Kate Preskenis.